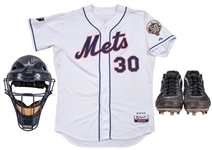 Offered here are three items worn by New York Mets catcher Josh Thole. The first item in this lot is Thole’s white Mets home uniform worn when he caught Johan Santana’s no-hitter against the St. Louis Cardinals on June 1st, 2012 at Citi Field. 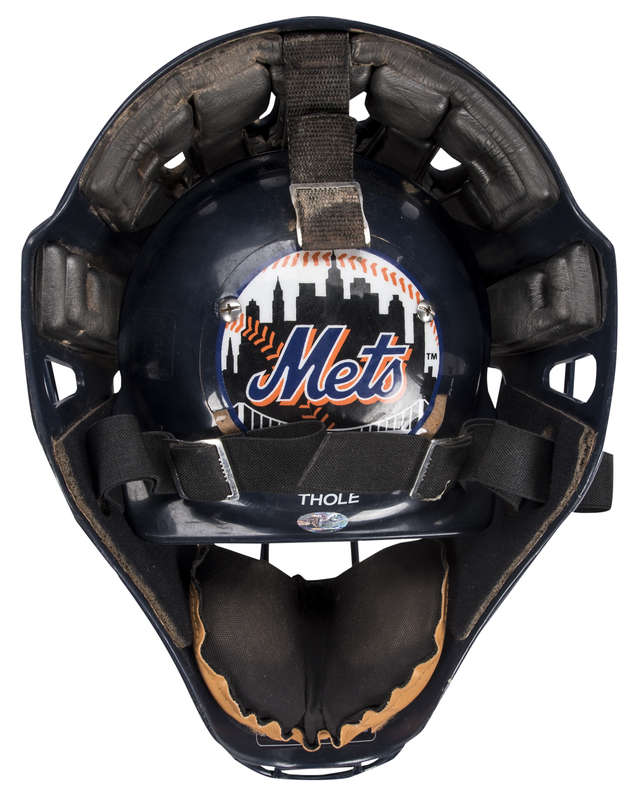 Thole called this game perfectly, with Santana striking out eight Cardinals batters over nine hitless innings. 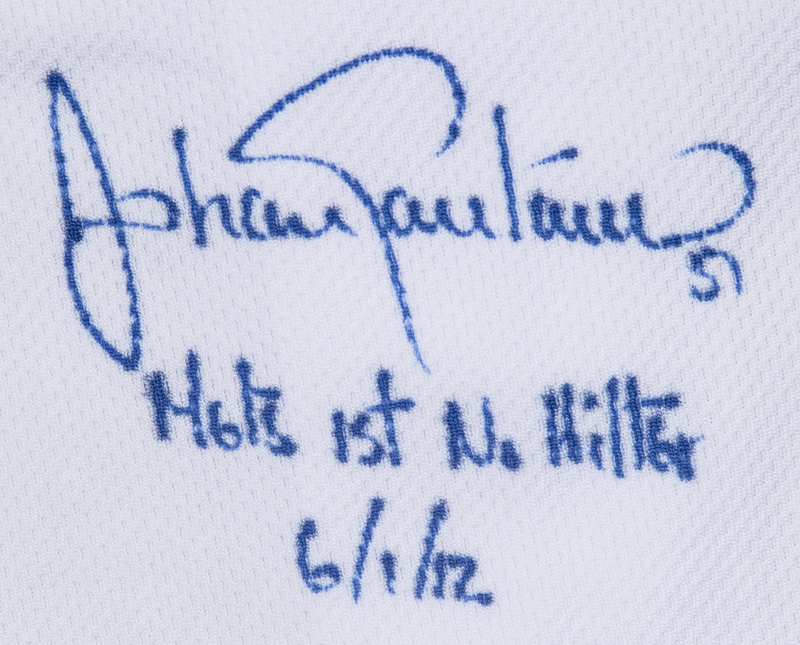 This the first, and to date only, no-hitter in New York Mets history. 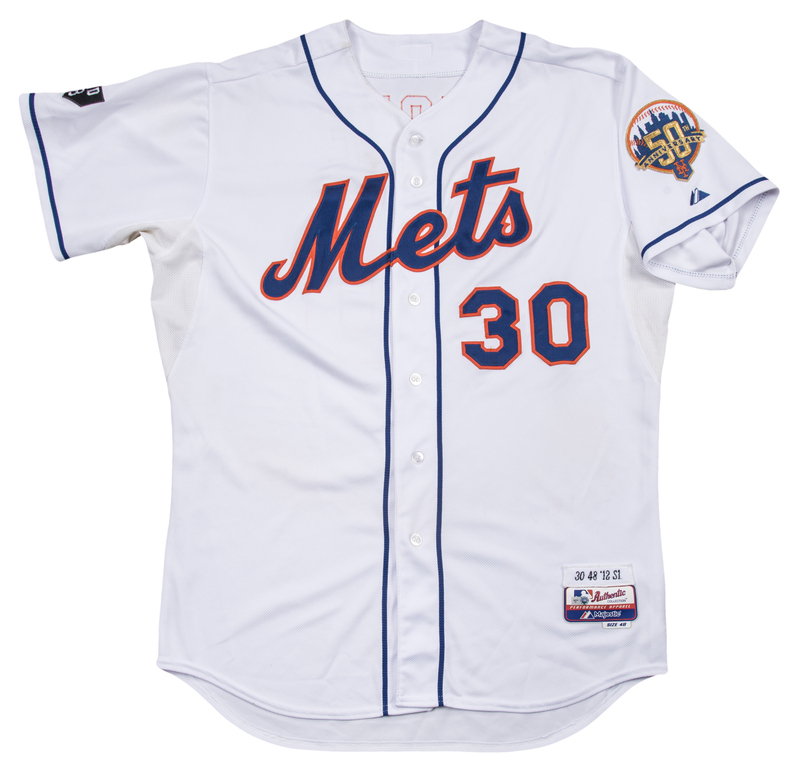 This white button-down jersey has “Mets” and Thole’s number “30” sewn on the chest in blue and orange tackle twill. 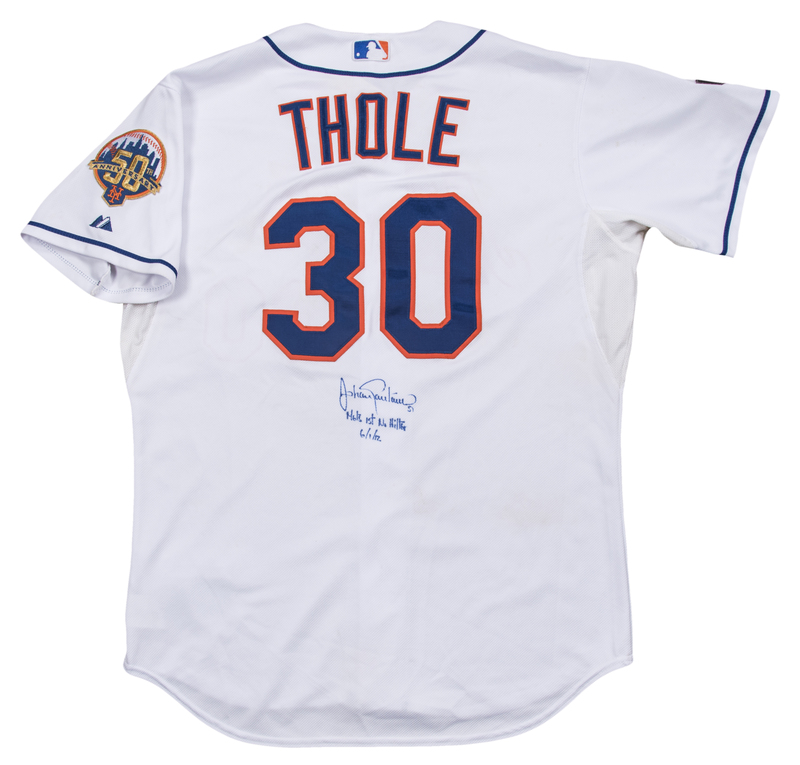 “THOLE” and a second “30” are sewn on the back of the jersey in the same fashion. 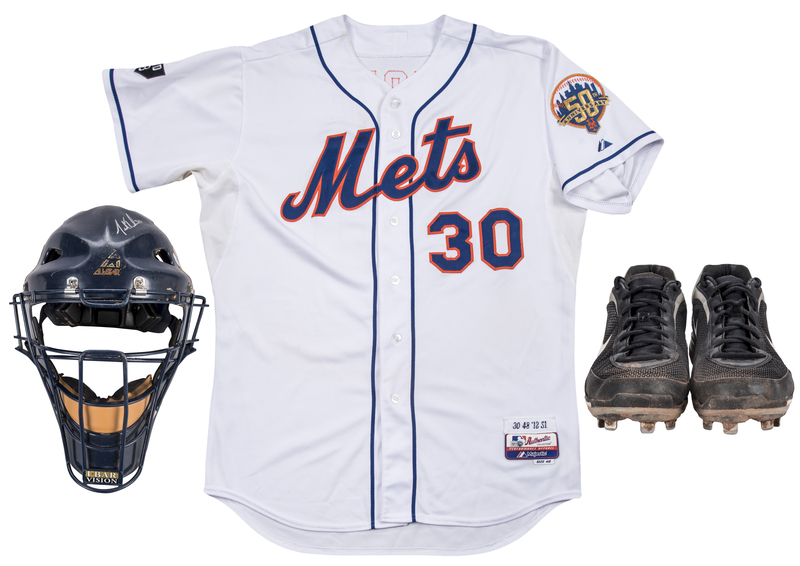 A Mets 50th Anniversary patch is sewn on the left sleeve, while a Gary Carter memorial patch is sewn on the right sleeve. 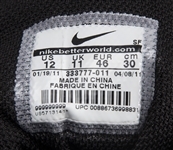 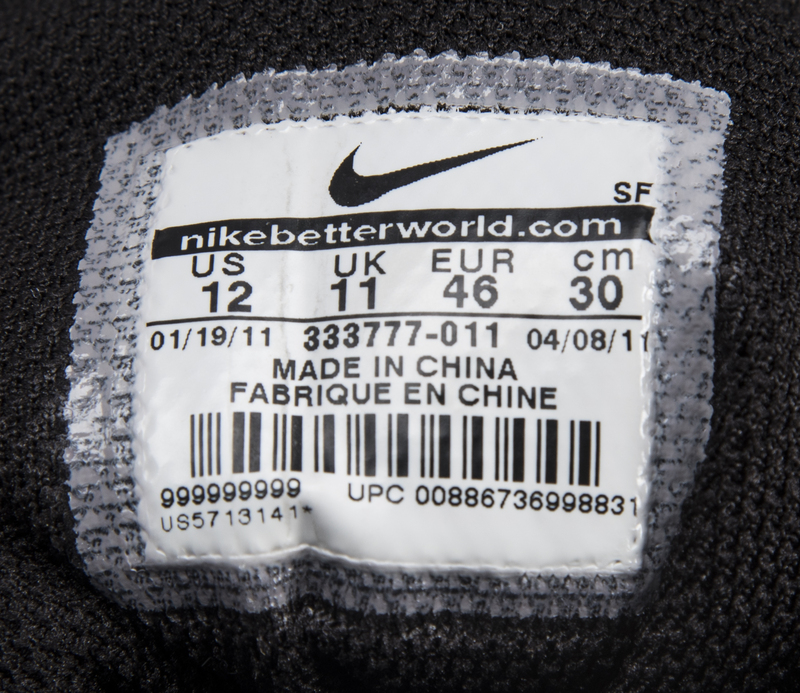 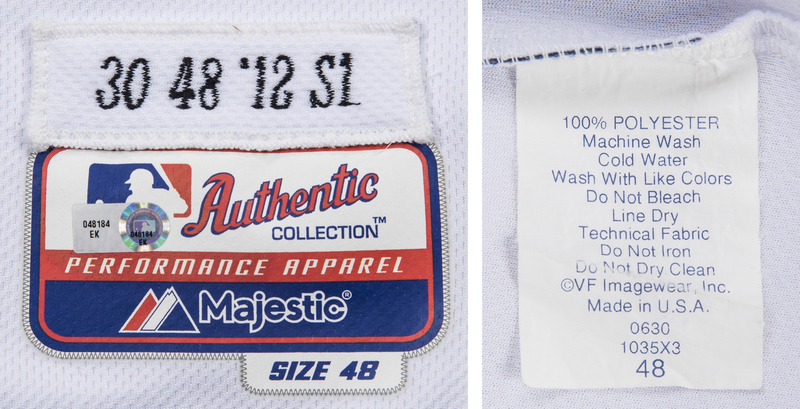 A Majestic size “48” tag is applied to the front left tail below a “30 48 ’12 S1” swatch. 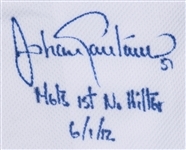 This jersey has been signed on the back by Johan Santana in blue marker, with Santana inscribing “Mets 1st No Hitter 6/1/12” in addition to his signature. This jersey comes with a MLB Authenticated hologram (EK 048184) and a COA from Amazin’ Mets Memorabilia. 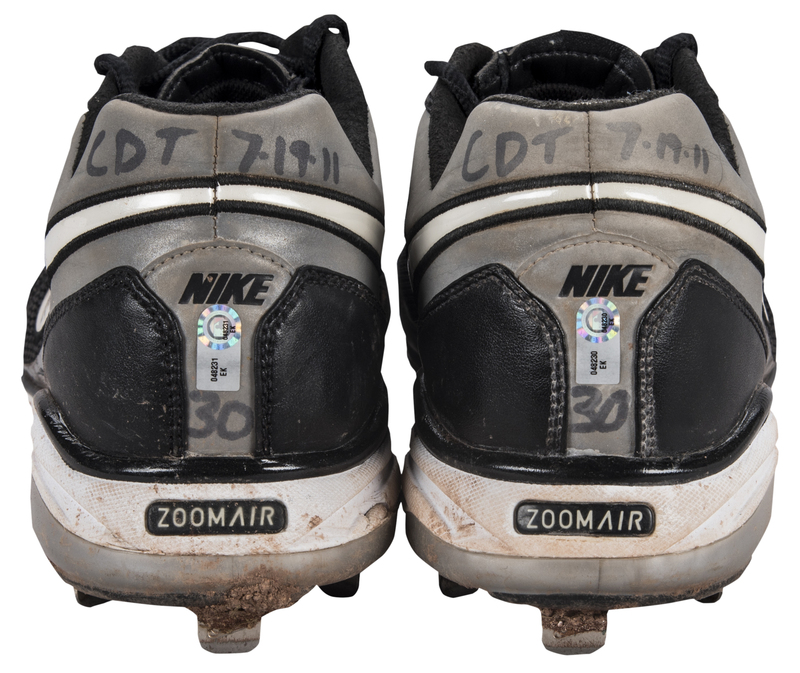 Also included in this lot are Thole’s Nike Zoom Air size 12 low-top cleats worn during Santana’s no-no on June 1st, 2012. 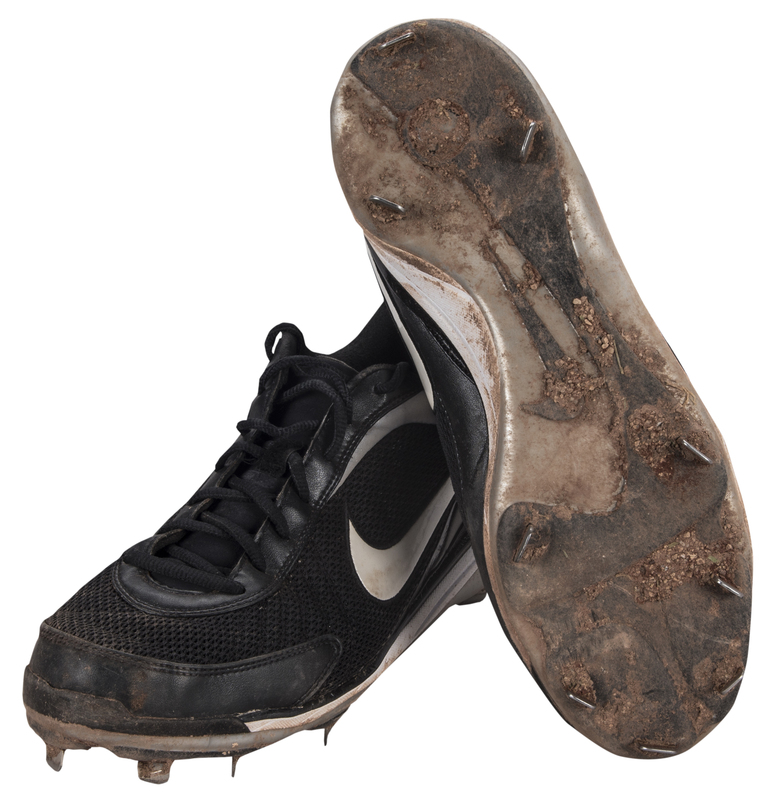 These black and white Nike cleats have nine metal spikes on the soles. 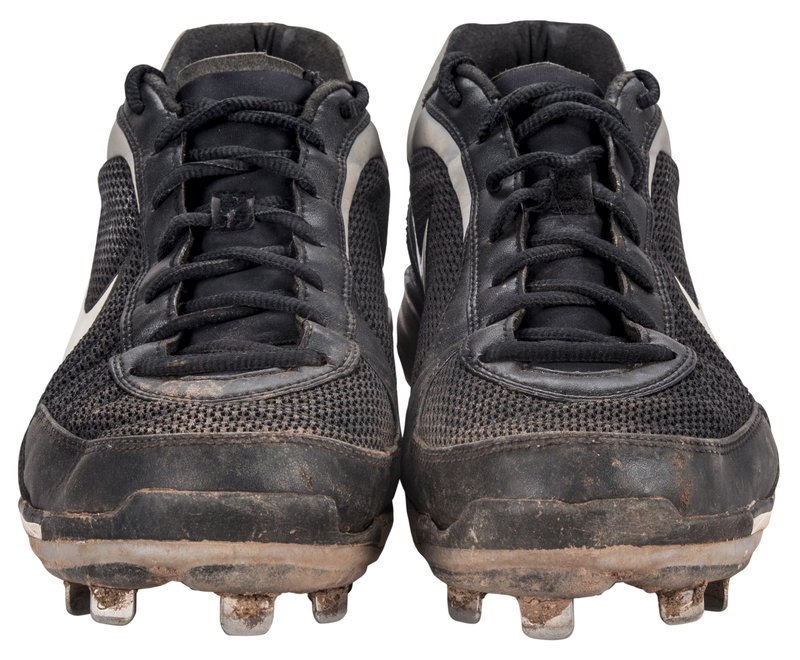 “CDT 7-19-11” and Thole’s number “30” are written on the back of each cleat in silver marker. 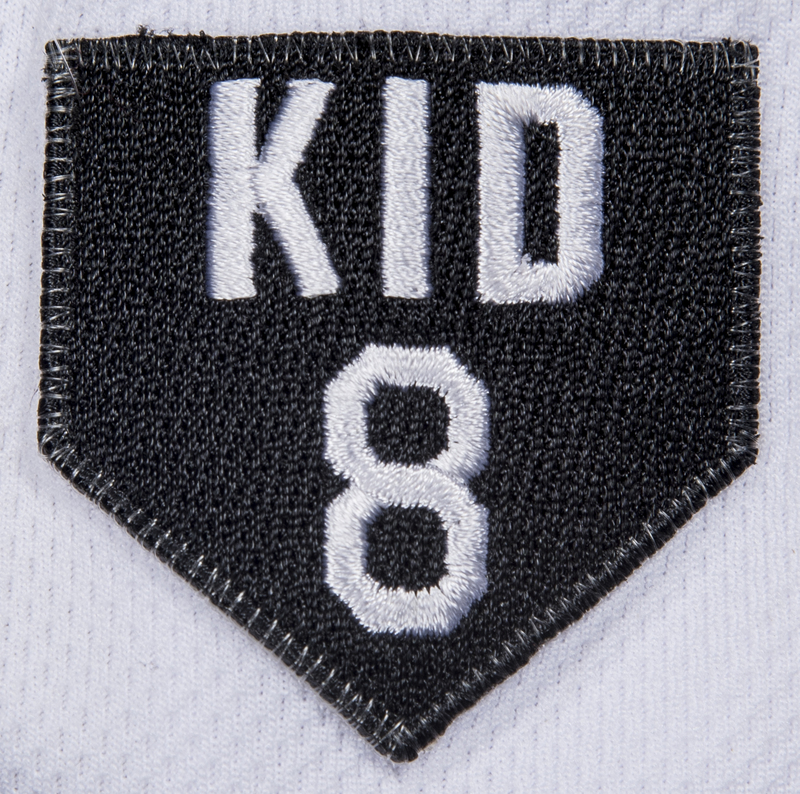 “CDT” refers to Thole’s son Camden, and the July date is the young Thole’s date of birth. 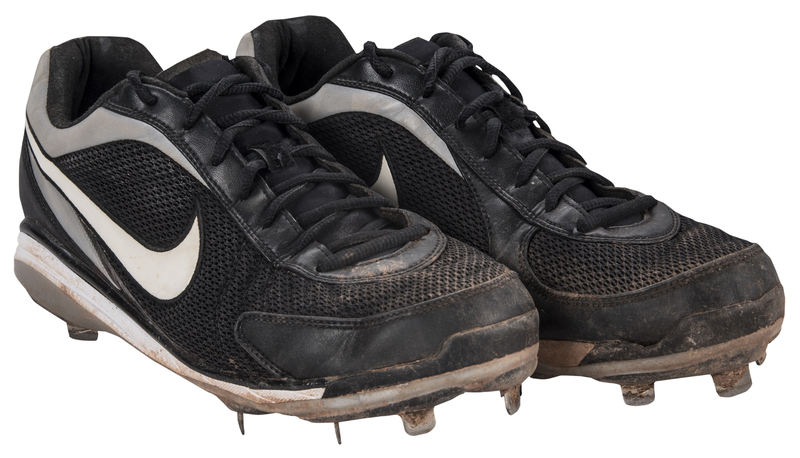 Each of these cleats comes with a MLB Authenticated hologram (EK 048230, EK048231) stating that the cleats were delivered to MLB authenticators by Mets equipment manager Kevin Kierst. 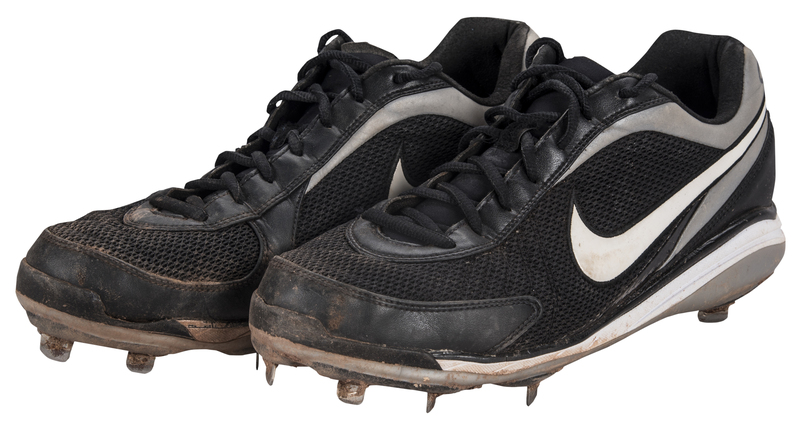 Additionally, these cleats each come with a COA from Amazin’ Mets memorabilia. 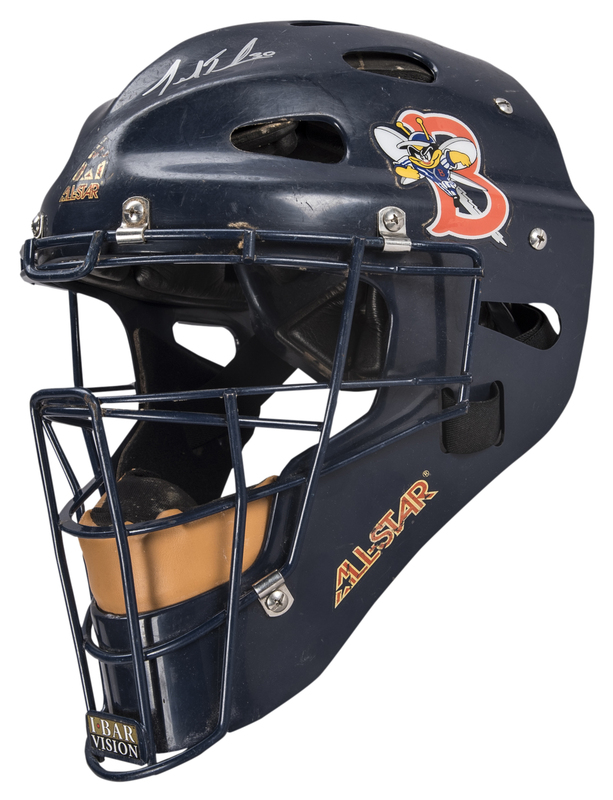 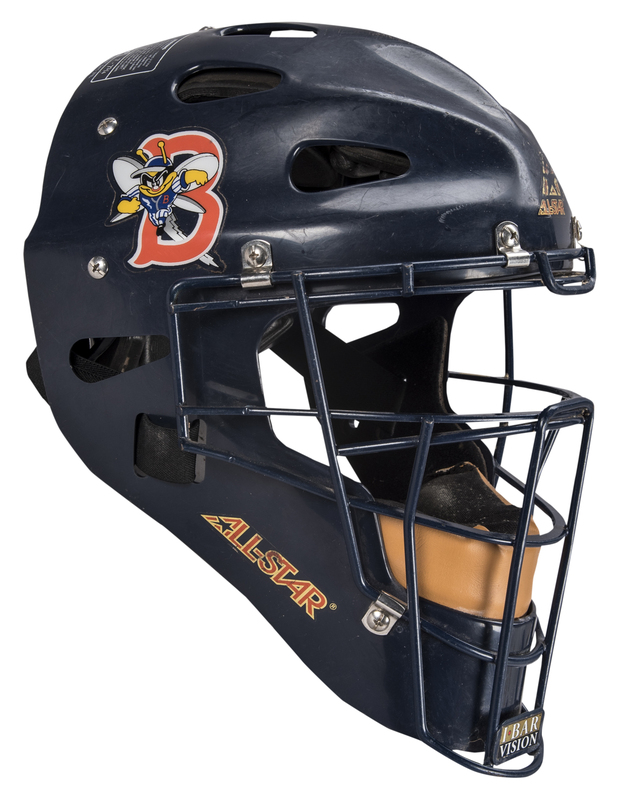 Finally, Thole’s catcher’s mask dating to his time with the Binghamton Mets. Thole played 103 games with Binghamton in 2009, hitting .328 with 46 RBI and 29 doubles for the AA Eastern League team. 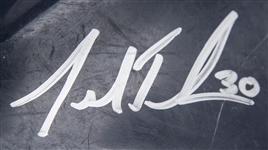 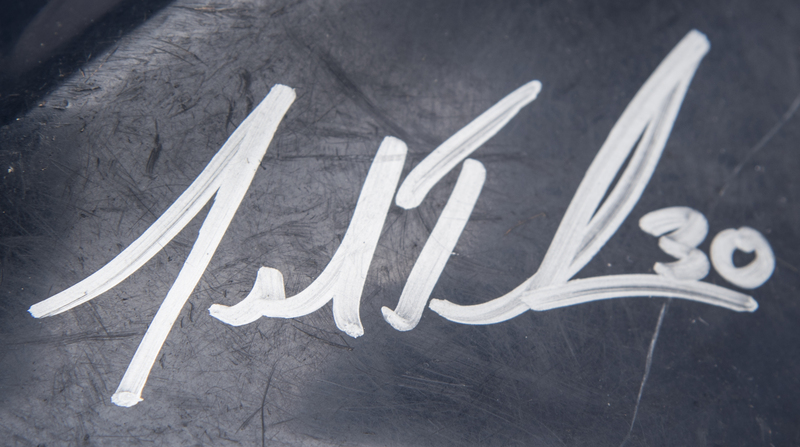 Thole has signed this catcher’s helmet in silver marker. 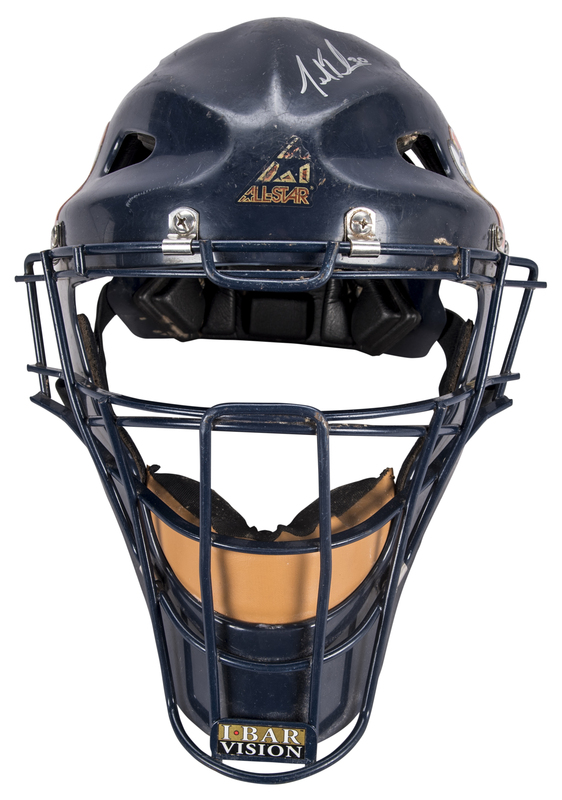 This item comes with a Steiner Sports hologram.